Located in North Carolina’s Albemarle Sound region, Pasquotank is one of the “finger counties” in the northeastern part of the state. And politically and demographically, Pasquotank has much in common with its neighboring counties on the coast, with one exception – Elizabeth City. Elizabeth City has a majority black population and is also home to Elizabeth City State University, a historically black college. With over 18,000 residents, a majority of Pasquotank residents live in the city. Pasquotank’s high black population makes it very difficult for Republicans to win the county. Forecast: The last Republican to win Pasquotank was George H.W. Bush in his 1988 landslide against Michael Dukakis. Republicans, however, often come close: both George W. Bush in 2004 and Richard Burr in 2010 came within three points of carrying the county. (Bush lost it by 2.75%, Burr lost it by 2.76%). But the high black population is a huge hurdle for them. Whites in Pasquotank are also not as conservative as “Down East” white voters and are not so monolithically Republican. The same is true for the rest of the finger counties, but none of them have an urban area the size of Elizabeth City. 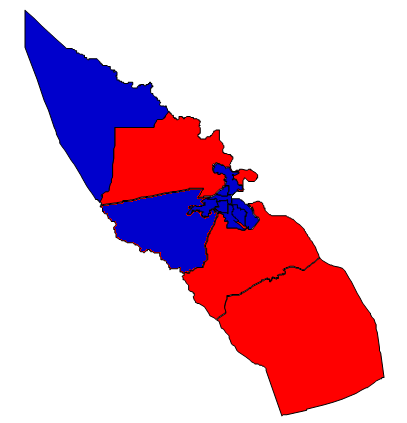 Therefore, Pasquotank is blue while its neighbors are usually red. There are, however, some bright spots for Republicans. An influx of residents, mostly retirees, from the Virginia Beach area has brought many Republicans to the area. Many of these new residents are white. The black population has failed to keep up. On the other hand, the massive registration effort from the Obama campaign was a huge success, and African Americans in Pasquotank County are now voting in larger numbers than ever before, and the President performed better here in 2012 than he did in 2008. The future in Pasquotank favors Republicans, however. African American turnout is likely to drop slightly once Obama is off the ballot, and there are fewer “unlikely voters” for Democrats to target and register than in past years. Growth within the county is likely to continue to help Republican candidates. The only thing they have to be wary about is the strongest growth from Hispanics, which was nearly 300% during the 2000s. However, they still compose only 4% of the population in the county. These countering trends have resulted in Pasquotank now being as classified as a “strong Democratic” county, while in the past it was only lean Democratic. Still, races in Pasquotank are likely to narrow significantly and return to the status quo. In a strong election year for the GOP, Pasquotank will be competitive for Republican candidates.